- Variable infeed speed 0-75 ft. /min. - Colors available; Orange, Green, Yellow, Red. Color samples available, please request if color shade is a concern. WoodMaxx TM-series chippers are the perfect combination of size, weight, and features. Compact enough to move around, yet strong enough to get the tough jobs done. TM-series chippers are loaded with features typically found on much larger commercial machines that are much more expensive. The strength of our machines starts with using heavy formed Q-235 (American standard A-36) structural steel plate, the strongest plate steel available. Each piece is precisely laser cut and meticulously welded. The WoodMaxx TM-series chipper exclusive structural design includes a direct drive 40mm diameter main shaft that passes straight through the flywheel housing and is supported by 2 flange bearings. This feature allows the flywheel to run true and adds a great deal of strength. WoodMaxx is the original chipper of this design. With over 2-1/2 years of development the WoodMaxx TM-series chipper offers the highest level of quality and innovation, with many exclusive features not found anywhere else. For sub compact tractors, there is no other chipper on the market that can do what the TM-86H can. The WoodMaxx TM-86H requires a tractor with a category 1 or 2 three point hitch and at least 15 hp. at the PTO up to 50 hp. Of course chipping capacity is directly related to horse power and torque, therefore with 15 hp. you can expect to chip 3" hard and 4" soft material and with 50 hp. you can expect to chip any material up to 6" in diameter with no trouble. In testing a 25 hp. tractor gave excellent work to fuel consumption results. Tractors with more than 50 hp. will not over power and damage the wood chipper since it is shear bolt protected, but are simply going to burn more fuel to accomplish the same results. 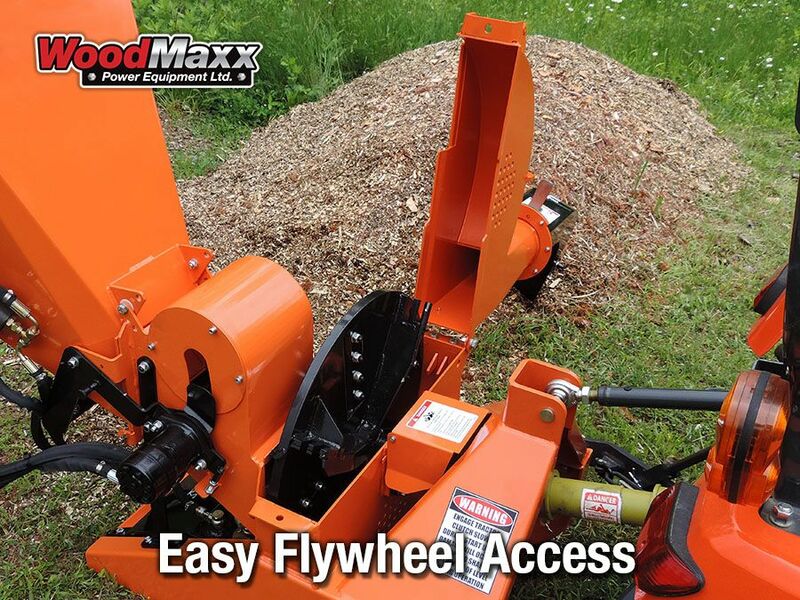 WoodMaxx TM-86H chipper offers a large 8" x 6" infeed to easily accept those crooked branches. Although the opening is this size, the material you can chip is dictated by the HP of your tractor. With a 15hp tractor (at the PTO) you can expect to easily chip 4" material. 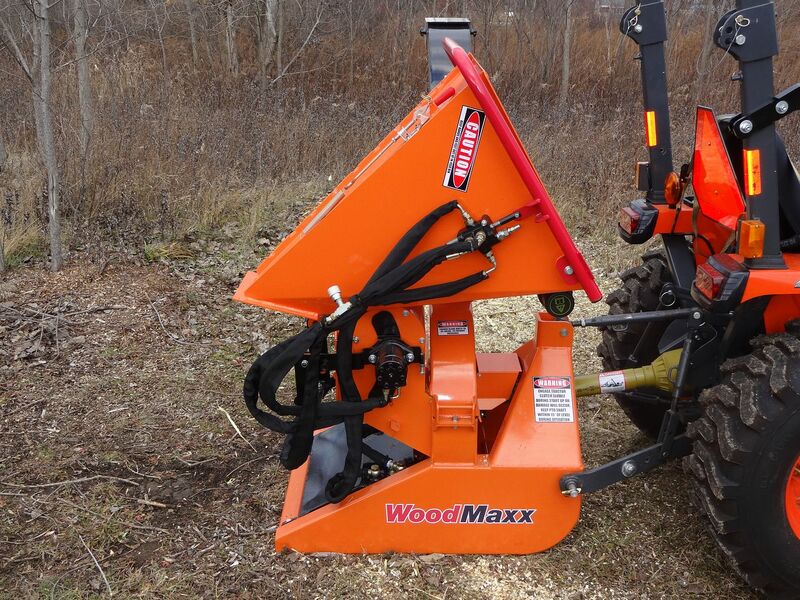 The WoodMaxx TM-86H chippers use a 24" diameter 120lb. solid steel flywheel to deliver the energy required to easily chip all types of material. The flywheel is computer controlled dynamically balanced to ensure smooth running. 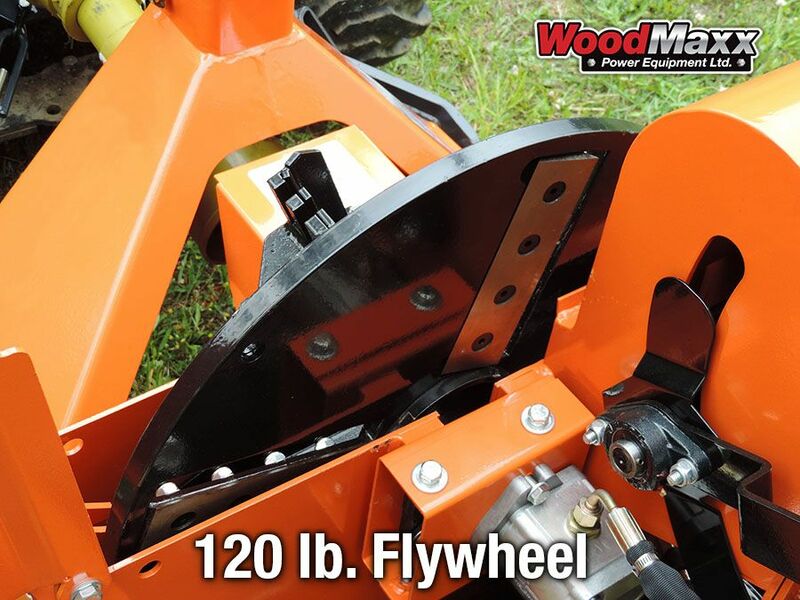 Through thorough testing and experimentation, WoodMaxx has discovered that the 120lbs flywheel is ideal for sub compact tractors. Larger flywheels do not produce optimal effects when used with sub compact tractors, since larger flywheels require more horsepower to turn, which reduces chipping capacity and efficiency. With larger flywheels, horsepower is diverted into turning the flywheel, instead of chipping your branches! The WoodMaxx TM-86H chipper comes shipped to you on a pallet and is completely assembled, ready to work. All that is required for set up is to attach the chipper to your tractor, fill with hydraulic oil, and go to work. This infeed bin of this chipper easily folds up for shipping and storage; the foot print of this chipper is only 36" x 33" for storage. All WoodMaxx chippers are given a comprehensive 22 point inspection, and are serviced prior to leaving our warehouse. The knives have been installed, adjusted, and torqued down, and bearings have been greased. These steps eliminate assembly time on your end. Just follow the illustrated, American written, user friendly assembly manual, and you will be up and running in about 1/2 hour or less. No other chipper on the market is this user friendly. 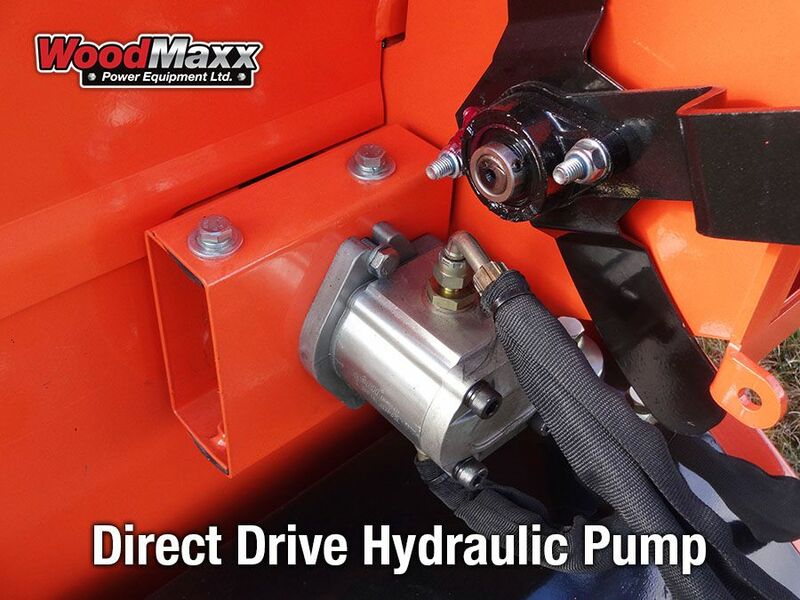 WoodMaxx TM-86H wood chipper is equipped with hydraulic control valves that are made in Italy by Hydro-control. Known for their high precision engineered control valves, Hydro-control designs and manufactures directional control valves for mobile applications and offers some of the most dependable products on the market. This is the highest quality hydraulic control valve available for any fluid power control application, and offers extremely smooth and reliable operation. Hydro-control has been involved in manufacturing hydraulic components since 1969, and has millions of products throughout the world in some of the most demanding applications. 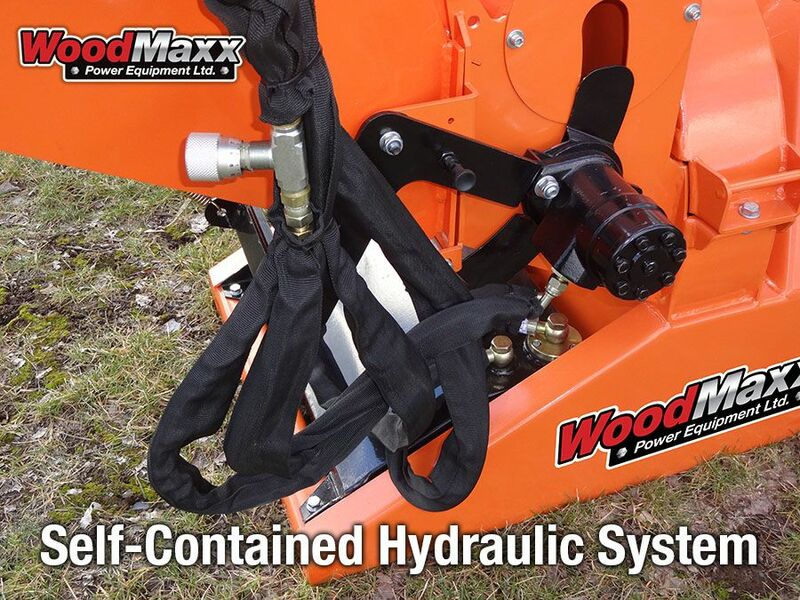 The WoodMaxx TM-86H chipper comes complete with a hydraulic pump and a 5 gallon reservoir tank to power the infeed motor. The hydraulic motor is a standard SAE 2 hole "A" mount. What does this mean to you? Down the road if there is a need to replace the motor, it can be found just about anywhere. Please note, you will need at least 15 horsepower at the PTO to operate this machine. WoodMaxx TM-86H wood chippers are equipped with USA "White drive products" brand hydraulic infeed motors. White is renowned for their high quality American engineered hydraulic motors. SAE, JIC fittings are widely used in fluid power applications throughout the USA and Canada. 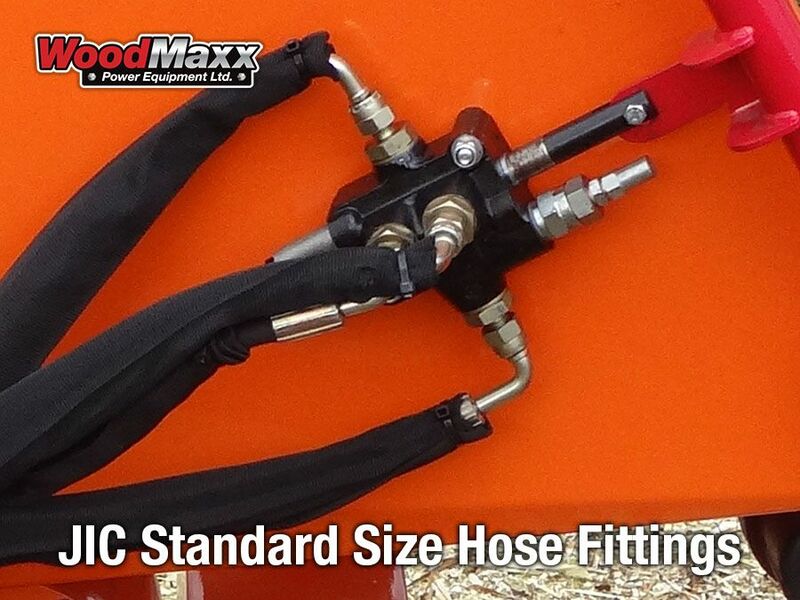 As a WoodMaxx customer, this means replacement hoses can be made just about anywhere. The hoses on the TM-86H are also covered in a nylon protective sheath to protect from damage. 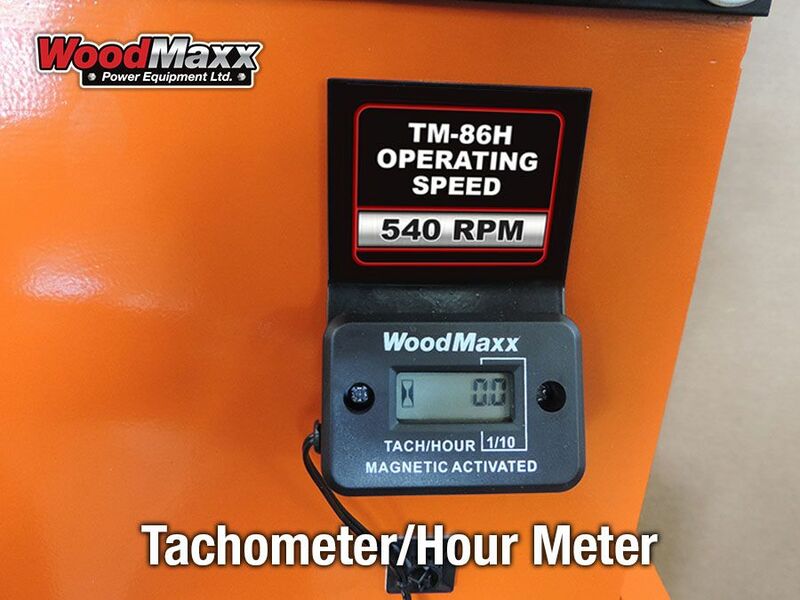 WoodMaxx TM-86H PTO wood chipper is now equipped with a convenient tachometer/ hour meter allowing the operator to see the actual RPM of the flywheel to ensure that the chipping head is running at the optimal recommended speed. Proper flywheel speed is important to develop the inertia required to chip hard material and evacuate the chamber effectively. The hour meter is helpful to ensure that proper maintenance intervals are kept in accordance with WoodMaxx recommendations. This all-weather meter is water proof and weather tight. Another WoodMaxx exclusive! We all know what happens to the branches when they reach the flywheel, but getting the material to pull into the chippers quickly and effectively is the trick. After countless hours of research and development on the infeed system, we have developed a large diameter (6.25") infeed roller that easily climbs up and grabs the branches to bite in and efficiently pull the material into the flywheel. The larger the roller, the easier it rolls over the material. The smaller the roller, the more likely it is to slip and spin on the branches. We equate this to the small wheels of a shopping cart stopping when it contacts a small stone in the parking lot. 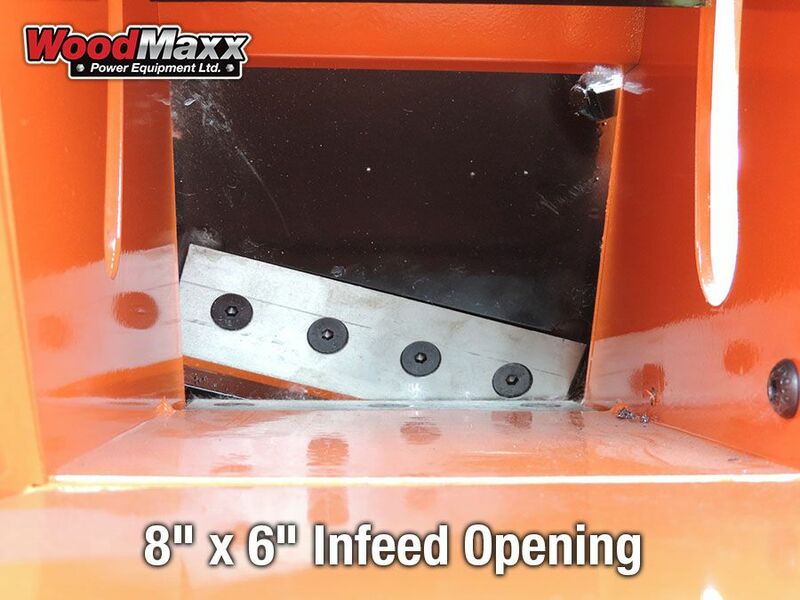 WoodMaxx auto feed chippers now utilize an infeed roller with high carbon steel chisel teeth. This type of infeed roller is found on larger, much more expensive machines. We have also spaced the teeth out the prevent material like leaves and bark from getting impacted between the teeth. This allows the roller to self-clean and also allows the 125lbs of down pressure to focus on fewer teeth which increases the bite. This roller, along with the high tension spring aggressively bites into any type of material. After welding, these rollers are induction hardened to ensure that the teeth stay sharp for many years to come. The advantage of this type of roller is that is aggressively grabs any size limb up to 6" with or without leaves. Small, vine type material as well as long or short needle pine is no problem for the WoodMaxx TM series chipper. Vines, leaves, and small branches won't wrap around the roller as they would on other chippers. 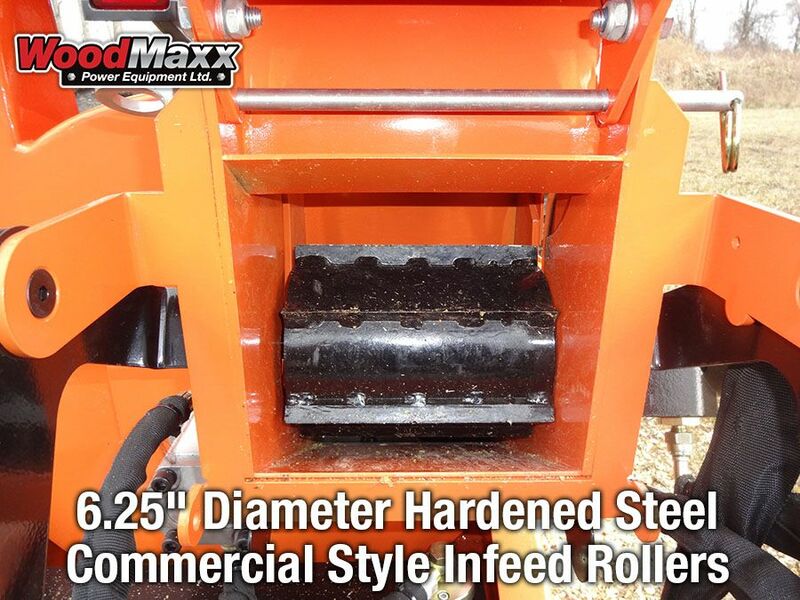 The advanced design of our infeed roller is a feature that should not be overlooked when shopping for a wood chipper. The WoodMaxx TM-86H is a high torque direct drive chipper, no drive belts to adjust or replace. The chipper flywheel speed is 540 rpm, this is why the chipper uses four knives on the flywheel instead of 2 as our higher flywheel speed WM-series chippers do. Ultimately the end result is the same... 36 bites per second. WoodMaxx TM-series chippers now all come standard with high carbon CR12 reversible dual edge flywheel knives. This means you get twice the work out of one set of knives! 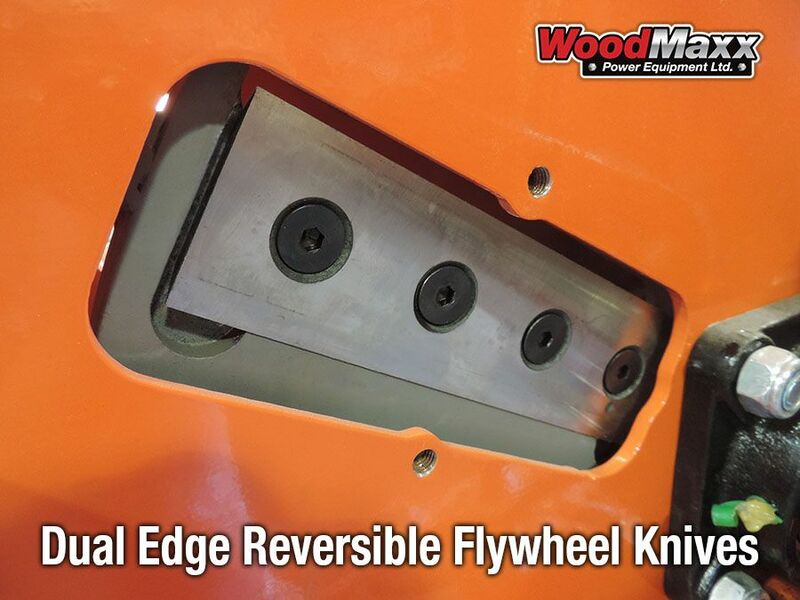 These knives are bolted into a milled pocket in the flywheel, incorporating a new flywheel pocket design developed at WoodMaxx. Unlike most other reversible knives, which are only held on by bolts, the flywheel on the TM-series chipper was designed to actually help to hold the knives on. This eliminates knife and bolt breakage that can be found on other dual edge knife systems. Optional USA made A8 tool steel knives are also available. WoodMaxx TM-series wood chippers are equipped with an adjustable bed knife to ensure that the proper knife gap is achieved. This feature allows the user to adjust the distance between the flywheel knife and the bed knife so that the required distance is maintained after knife sharpening. Proper gap is important so that even the smallest material is chipped as it passes through the chipper. 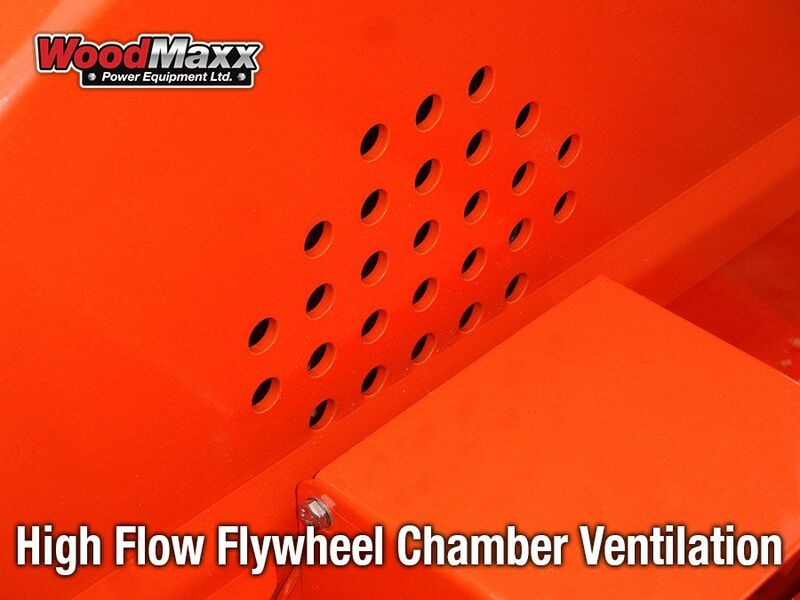 WoodMaxx WM-series chippers incorporate a series of precisely located ventilation holes in the flywheel chamber. This feature creates a strong vacuum that draws air into the flywheel chamber and in combination with the fan blades on the back of the flywheel forcefully ejects the chips out of the chamber. This keeps the discharge chute clear, and reduces the chances of a jam. The WoodMaxx patent pending hole pattern is specifically designed to bring the air into the chamber at the optimal volume and location. Other machines have tried to copy this feature, but have not achieved the same results! All WoodMaxx TM-series chippers are now category 1 quick hitch compatible. WoodMaxx is the only PTO chipper that works with quick hitch (also works with John Deere I-match). Save time by never leaving the seat of your tractor to link up with the TM-series chipper. Attaching the chipper to your quick hitch takes only seconds. Check out our video tab to see the quick hitch in action! No quick hitch? No problem. The chipper will easily attach to a standard 3pt hitch. 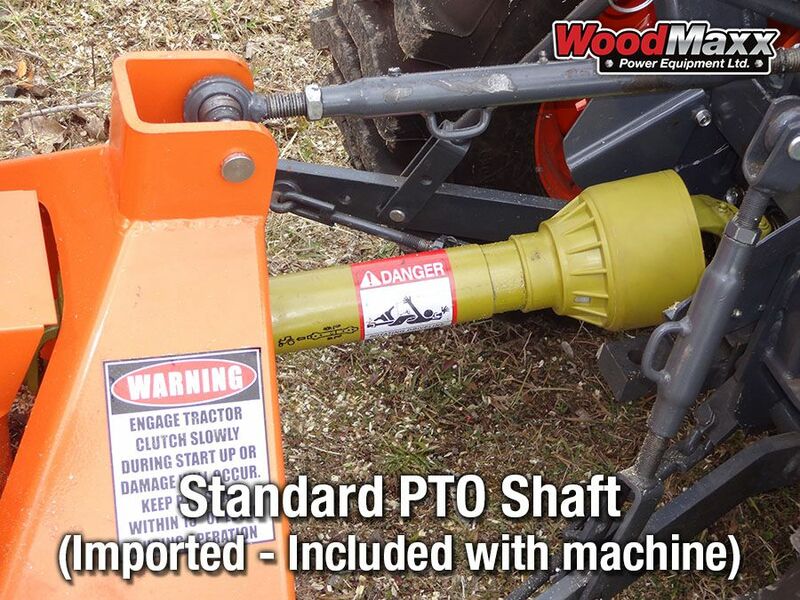 Please note, you'll need the Premium PTO shaft or a longer imported PTO shaft if you have a quick hitch (contact us for more info). Two heavy duty cast steel flange bearings support the 40mm main shaft, which passes through the flywheel housing, and is supported by a flange bearing on either side. 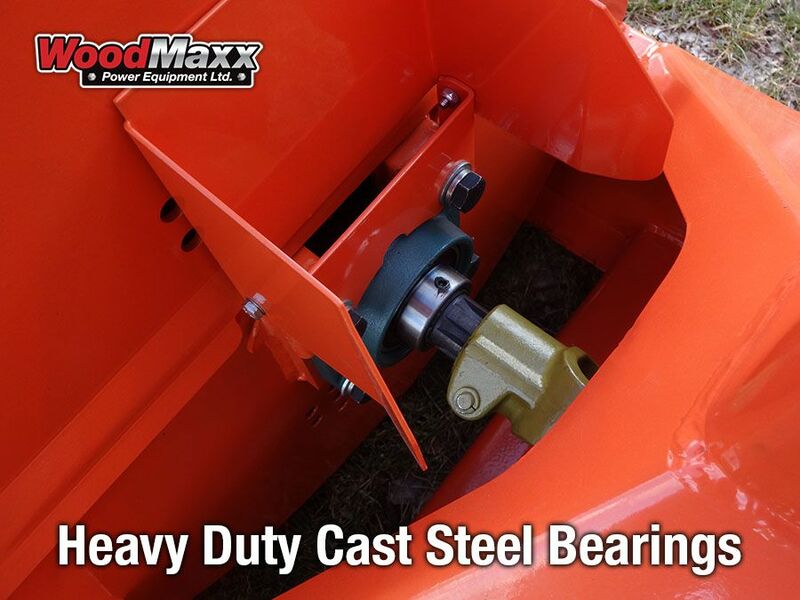 This heavy duty, shock resistant cast steel bearings are much more durable than cast iron - a unique feature of all WoodMaxx chippers. 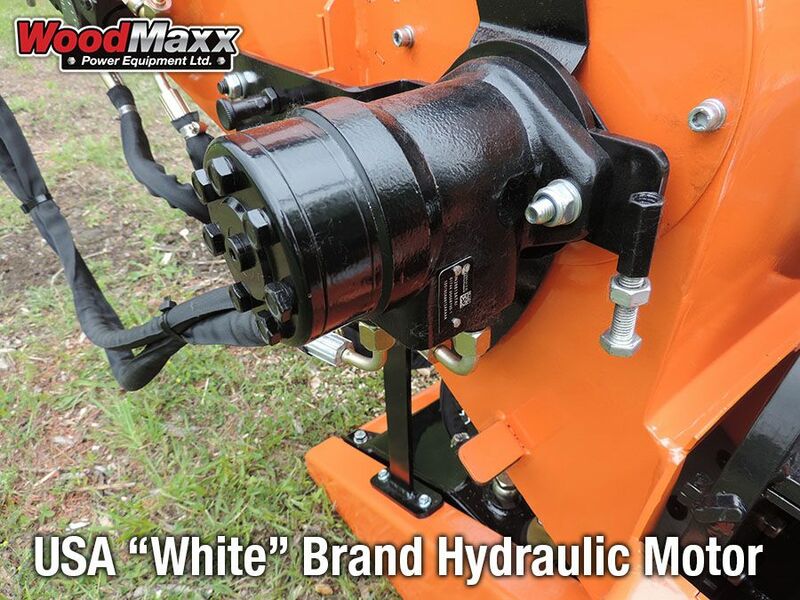 The WoodMaxx TM-86H wood chippers are equipped with USA "White drive products" brand hydraulic infeed motors. White is renowned for their high quality American engineered hydraulic motors. The speed of this motor can be controlled to variable speeds from (0-75ft. /min) with the included pressure compensation flow control valve that allows for very precise infeed speed adjustment. The aggressive hydraulic powered infeed roller and the design of the sloped infeed bin itself work together to pull material into the chipper head. This feature allows the user to slow the infeed speed down to accept large material. 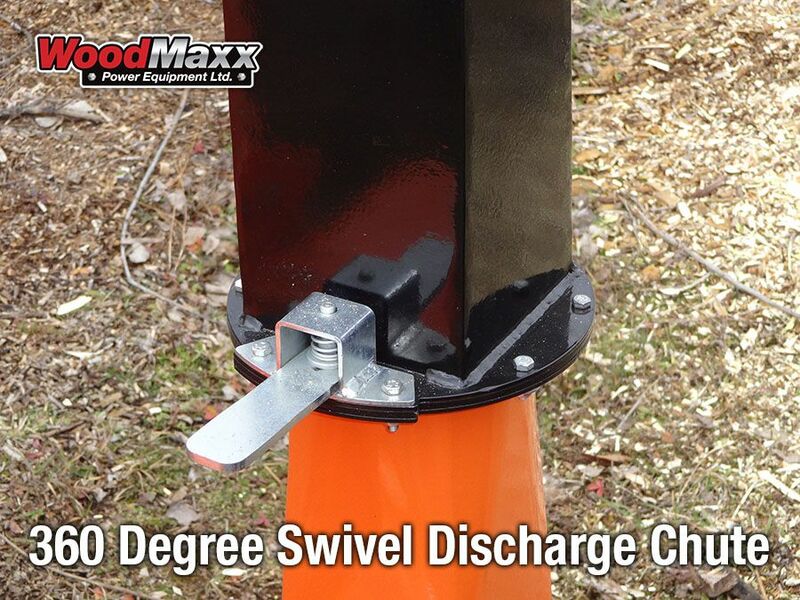 The WoodMaxx TM-series chipper utilizes a high tension spring in conjunction with a unique adjustment mechanism that offers a full range of variable down pressure, since all branches are different - some soft and some hard. This feature allows the user to increase to decrease the upper roller down pressure to suit the situation. Crank up the tension to achieve up to 125lbs. of down pressure. This allows the teeth on the roller to dig into the branches and ensure a smooth entry into the chipper head. We stock made in USA replacement knives and made in USA Holo-Krome class 12.9 knife bolts for the TM-series chippers. Designed for extreme duty - there is no better material that can be used for superior life and performance than our heat treated through hardened, high carbon, high chromium, A-8 tool steel knives. The flywheel housing of the TM-86H opens up like a clam shell. This makes maintenance like changing flywheel knives a breeze. This robust chipper comes with an equally robust 3 year parts warranty. If parts are required or a warranty claim is necessary, our service department stocks a full line of replacement parts. Just give us a call, and an experienced service tech can assist you with anything you may need. Light enough for small sub compact tractor to lift, yet extremely strong construction. Safety is paramount on WoodMaxx chippers. 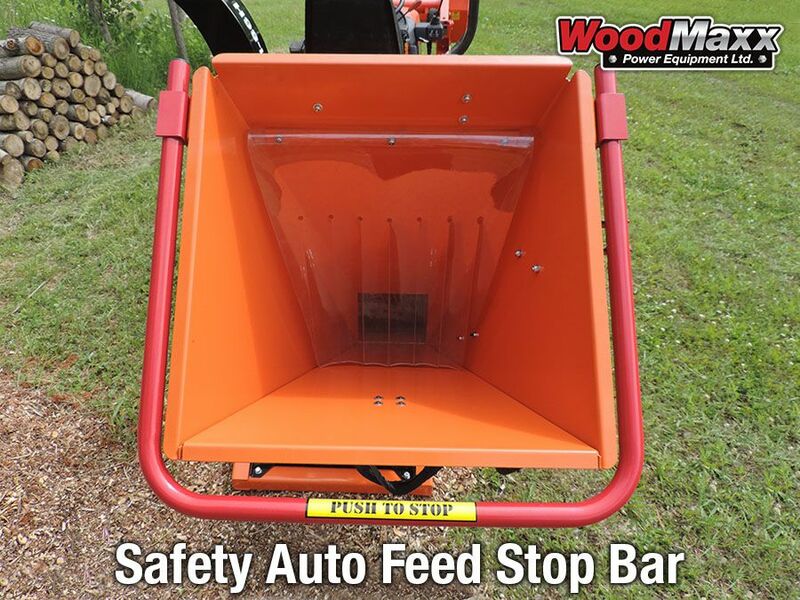 Located surrounding the infeed bin, the TM-86H utilizes an easy to activate hydraulic auto-feed stop safety bar to disengage the infeed rollers in case of an emergency, or to clear the infeed bin if necessary. By simply pushing on the bar, the user can stop and even reverses the direction of the infeed roller. 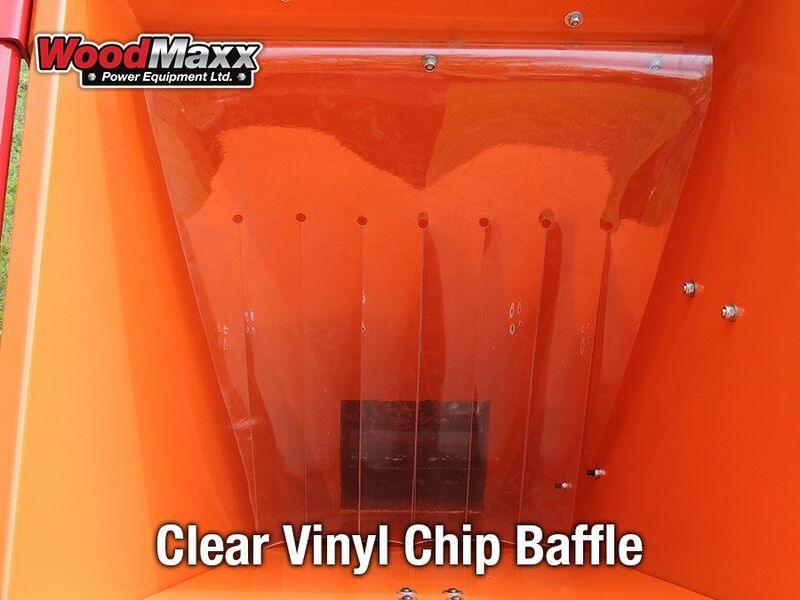 WoodMaxx chippers are extremely robust, and can handle heavy use. With years of experience and thousands of machines in service today, we are confident that this machine can handle even the toughest projects that you have. Our machines are currently in service in several commercial applications, such as: the Army Corps of Engineers, college campuses, municipalities, farms, golf courses, apartment complexes, and thousands of residences. WoodMaxx chippers are also represented around the globe, with machines as far away as Hawaii, and Alaska, as well as several countries including: Ecuador, Chile, Russia, Panama, Colombia, Poland, United Arab Emirates, Israel, west Africa, Greece, Norway, Iceland, Honduras, Ireland and of course Canada. The entire transaction from ordering to shipping was perfect. Using the chipper was a pleasure after struggling with other type/brands. Highly recommend WoodMaxx. This chipper will do everything as advertised. I have it on the back of a JD-2025R and no stall /bog down issues at all. Had a few issues with the chipper and what that resulted in was I quickly learned WoodMaxx stands behind there product 100% and (Joel ) in the service department is top notch. All issues resolved. If your looking for a great 6" chipper / and the all important great service, this is it. I ordered this chipper in hopes it would help me take care of a very over grown and over planted yard I purchased. I cut down over 70 trees including a hedge of 4" diameter Lilacs and 2, 55' high black ash trees. This is more than a chipper. It is a tree limb eating a machine. It is more than I anticipated. I am a fabrication supervisor and I am very impressed with the quality and performance of this chipper. I have a John Deere 1025R and this pair works great together. Highly recommended. The shipping crate has sharp edges that will cut write through nylon straps if you opt to pickup the. Upon completion of the assembly process it was time to try it out on the 75 ft hemlock that fell within inches of my house. The main reason I purchased this unit was to deal with the disease that is killing my hemlocks. The unit worked great and handled the hemlock branches with ease. But, I had one problem that was not address in the TROUBLESHOOTING guide, under Problem: "unit won't feed limbs properly". The in-feed roller lifted high enough that the locking pin engaged and locked the roller in the up position, I needed to remove this pin as it got damaged and I could not pull it back out. I go to use this chipper this morning and I should have purchased it years ago. I had some small trees growing in my flower bed. I cut them down with a chain saw. Fed them to the chipper whole and not even a burp. This equipment is awesome to put it mildly. If you have small trees or even prunings from other trees.This is the piece of equipment for you.